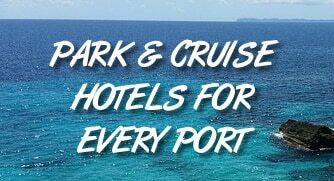 If you are flying in for your cruise or just don’t want to deal with the headache and expense of dealing with parking your car, we have you covered. The good news is that in a city with a mature transportation network like New York, you have a number of options in getting to the port. And if you’re overwhelmed with trying to get around the city, don’t worry, we’ll tell you exactly how to get to the terminal without dealing with driving. As for convenience, it’s hard to beat transportation network companies like Uber and Lyft. By downloading the app, you can call a car on demand, anywhere in the New York/New Jersey area. So even if you are flying into Newark or staying outside the city proper, you can still get a ride. If you think you want to take a rideshare service, you can read more details about Uber & Lyft here. If you are coming from an area airport to the Manhattan Terminal, then picking up a cab at the airport is easy as they all have taxi stations where you can hop in. Elsewhere in the city you can have your hotel call you a cab or simply go out and hail one like a local. Rates are typically a little higher than rideshare services. We’ve listed estimated rates in the table above. As you can see, you’ll spend a little (but not excessively) more to take a taxi. One suggestion is to take a cab if you are coming from JFK International. The taxis have a flat rate of $52 from the airpot to anywhere in Manhattan. The two most frequent visitors to the Manhattan Terminal are Carnival and Norwegian Cruise Lines. Both offer shuttle service to the port. Carnival has the most offerings of any cruise line we’ve seen in the area, with shuttles that will transfer you from all three major area airports. Prices are reasonable if traveling solo or as a couple, but you can still find a better deal with a cab or Uber/Lyft. Here’s a look at Carnival’s transfer rates. Note that rates a per person. Norwegian Cruise Lines also offers a shuttle, but only between New York’s LaGuardia Airport. If you are flying into JFK or Newark, you’ll need to use alternate transportation. The fare is $40 one way, per person. For a couple of reasons, we usually suggest going with another option than a cruise shuttle transfer. First, it is expensive if traveling with more than just one or two people.. The rates shown above are per person. So a family of four is paying $31 each ($124) just to get from Newark Airport to the cruise port, or $248 round-trip. Other options usually price based on the car, not the number of occupants. Second, cruise transfers are extremely limited. In this case, they run only from area airports to the Manhattan Terminal… and only on the day of sailing. So if you come in early or are staying at a hotel in the area, then the cruise line transfer isn’t a viable option. If you are traveling with a larger group to the Manhattan port, then your best bet is likely to look for an independent shuttle or private car service. These providers can offer private service to the port, usually for less per person than a taxi or other service, assuming you have seven or more passengers. If you want to use public transportation, the M50 bus runs east and west across Manhattan, along 49th and 50th Streets, dropping off right near the terminal. Bus fare is $2.75. You’ll likely need to transfer to the bus from a subway, unless you are staying near the M50 bus route. Many major subway lines have a station on either 49th and 50th Streets, including the A, C, E, N, Q, R, B, D, F, and M. You’ll simply need to get off and then catch the M50 bus eastbound to the cruise port. While cheap, riding public transportation can be a little confusing for first timers, and stressful when you are trying to carry your bags for a cruise. You can check out the information about the M50 route and riding the bus here to help you get your bearings. My family has been thinking about going on a cruise this fall. So, I liked that you pointed out that when we get off the boat there are several different transportation options. Personally, I think that a large shuttle or car service would work with our family.